The North Central DC-9. Presenting a shirt for "The Route of the Northliners!" In the original color livery (for the DC-9's) we have the blue and turquoise flying out of a golden sky on a 100% white cotton heavyweight shirt. 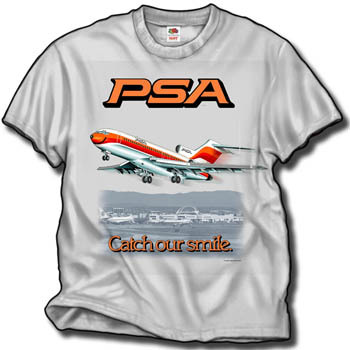 Large aircraft print on the back, with a smaller design with "Fly Herman" on the front. Pan Am 2 for $30.00 Sale!